The good questions you’re going to ask. Vinloco helps you choose the best wine you can buy for your money. Whether you’re shopping for your Friday night sauvignon blanc, an everyday shiraz or a celebratory champagne we will tell you whether you’re getting a bargain or whether you should consider another instead. We’ve analysed tens of thousands of independent wine judges’ ratings and prices from Australia’s top liquor retailers to produce an objective assessment of the wine you’re considering. We compare the ratings and the price of the wine you’re considering against all others in its category to conclude whether that bottle is great value or whether you can buy better for your money. What is the list of wines displayed below? This is a list of the top value wines in the same category as the wine you’ve just scanned at about the same price. If you’ve just scanned a $12 chardonnay, then we’ll show you the best $12 chardonnays in Australia. Are all these wines available where I’m shopping? Most lists should show at least one popular alternative wine you can find in your store. However, we recognise that most people shop for their wine in several stores at different times and that retailers usually stock different wines. We also want to recommend the best value wines in Australia so if you’re frequently seeing a wine in our lists that’s not stocked by your local retailer, maybe ask them to get it in or try buying it online. What do the numbers beside the wines mean? The rating is a score out of 100 given by one or more qualified and independent wine judges. Most ratings are given between 75-100. Wines that fall below that level are usually considered faulty and are not scored. It is very rare for a wine to ever achieve 100 points. The price on the right-hand side is an average of known retail prices for that wine and, together with the rating, forms the value equation for that wine that’s then compared against all others in its category. This price is merely representative of its retail price and may not be the same as the price you’d pay at any given retailer. Why do I have to enter a vintage for the wine? This helps us identify the exact critical rating for that wine. Ratings are specific to particular vintages as wines can vary greatly from year to year. You’ll usually find this information on the front label. Tip: sparkling wines, including most champagnes, and some low-priced still wines blend grapes from several years’ harvests and are therefore “NV” or non-vintage. What does it mean when the app says “this vintage is unrated”? If we don’t have a rating for a particular vintage, we use an average of the most recent ratings for that wine to provide an indication of its value. If we have no ratings at all for any recent vintages of that wine, we still recommend other wines of the same variety at about the same price but for which we do have expert ratings. What does it mean when the app says “This wine is controlled by the retailer”? Wines commissioned by retailers and sold exclusively by them are becoming increasingly common. Unlike groceries, which are usually sold under an obvious label, these wines often look very similar to branded wines sold by independent wine producers. These “buyers-own-brand” wines can sometimes be very good value and even receive respectable ratings at Australian wine shows. However, we don’t display their ratings or recommend them as doing so would compromise the limited space we have to recommend branded wines that can be found at a wider number of stores. I’m away from a bottle shop right now and don’t have a barcode to scan. Can I still use Vinloco? Sure. You can also search for wines by using the text search field at the bottom of the launch screen. Tip: use the fewest and most distinctive terms for the most effective search results eg: “oyster” for Oyster Bay Sauvignon Blanc. Because there are so many variables to a wine’s name, you might have to enter several strings or longer strings to find the exact wine you’re after, eg: “oyster bay sauv”. My scanner doesn’t seem to work. Sometimes moving the phone in and out from the barcode helps activate your phone’s auto-focus faster. 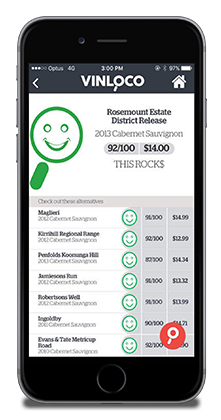 Why doesn’t the app provide an assessment for very expensive wines? The app compares a wine against all its closest alternatives. Unfortunately, this comparison becomes unreliable when a wine can only be assessed against very few alternatives which is sometimes the case for rare varieties or very expensive wines. While we recommend wines of a similar type and quality at lower prices, we recognise there are times when a buyer may have other reasons to purchase these “super-premium” wines such as for collections so we decline to provide a value assessment. How do I get started with Vinloco? Download Vinloco for free from your smartphone app market. After installing, simply tap the magnifying glass (“Touch to scan barcode”) to activate the barcode scanner.